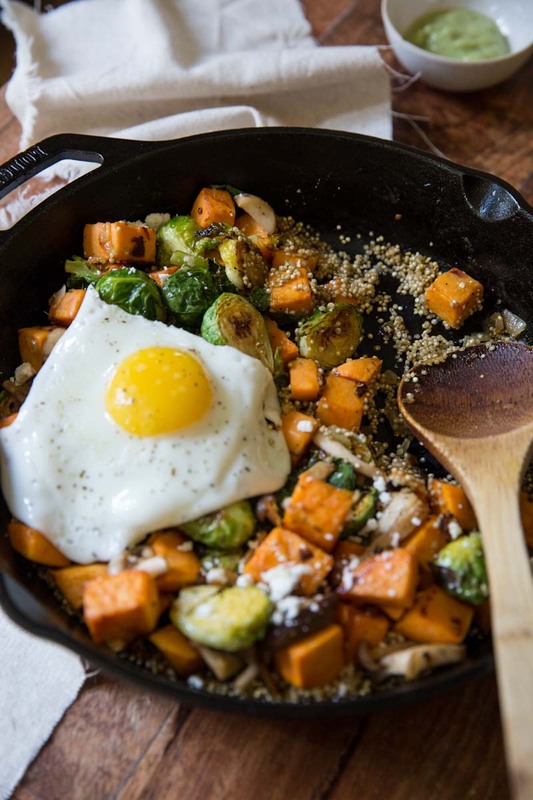 A good hash filled with veggies and topped with a fried egg is a go-to dinner around our house. When I said I only liked soft scrambled eggs, I guess I lied. I do enjoy a fried or poached egg when I can mix it all into what I’m eating like a hash or salad. Maybe I’m just beginning to be more of an egg person! That’s probably a good thing. I had a similar hash at Deer Valley’s Brass Tag, when I was on a girls retreat with some other bloggers a few weekends ago. I asked how their hash was made and came up with my own (much easier version) for you here. The Brass Tag cooks everything separately for the hash, which seems extravagant for home cooking, and requires too many dishes if you’re lacking a dishwasher (like at our home). So, I simplified a bit, using the same skillet for everything yet cooking the ingredients in smaller batches to maximize flavor. Deer Valley serves their hash with a red pepper sauce but the hash really doesn’t require a sauce, though this avocado cream sauce is another good match. I’m fulling embracing mushrooms this spring, especially more exotic ones which lend more flavor to a simple dish like this. And I’ve found that thyme is a perfect match for shrooms too. For this dish I sauté them separately giving them the attention they need so they can really boost the overall taste of the dish. When you toss everything together all of the flavors of each addition meld perfectly together in every bite! While our girls weekend was perfectly low key, of course we all left with new inspiration for our home kitchens. For me it was this hash, along with a few other dishes we enjoyed around Deer Valley. Oh and I had a fabulous grilled cheese made with pesto boursin cheese and havarti that a chef from Whole Foods whipped up for us in our condo. Easily the best grilled cheese I’ve ever had! Stepping out of my home kitchen for a weekend with other food bloggers turned out to be a great recipe for inspiration. Thanks to the Brass Tag and all of the girls for giving me a new boost in creativity. 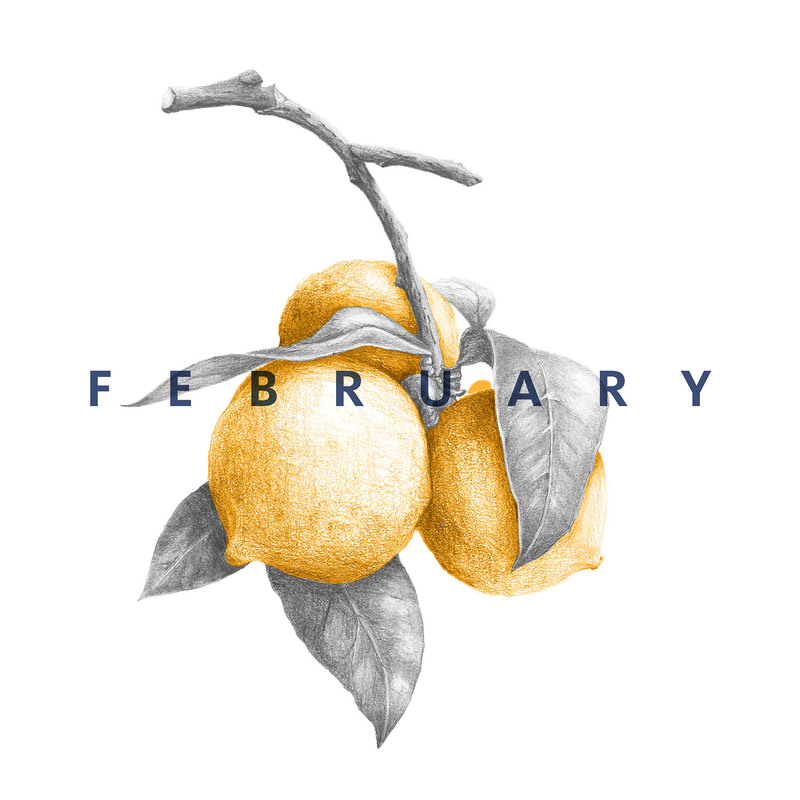 I’ll be sharing more on our weekend getaway tomorrow! 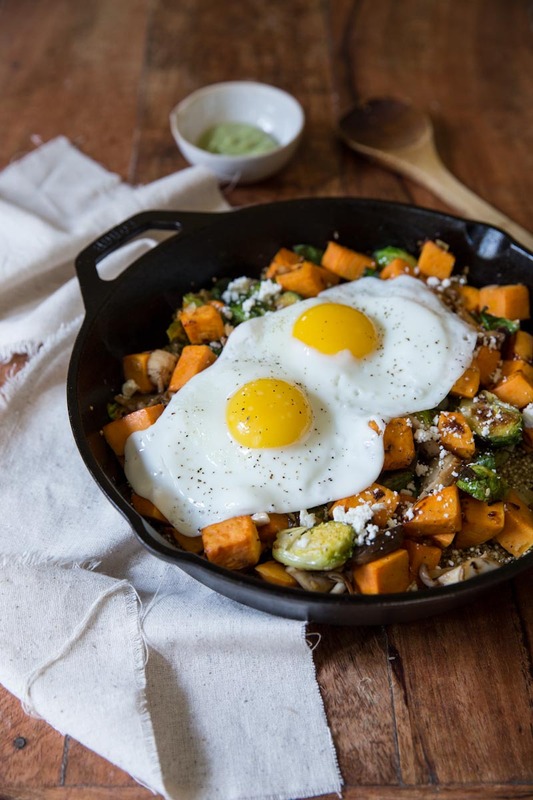 A colorful vegetable hash with quinoa, topped with fried eggs. Line a rimmed baking sheet with foil and preheat the oven to 375 degrees. Heat a medium skillet (I like to use a cast iron for this) over medium high heat with 1 tablespoon of the olive oil. Add the sweet potato with a sprinkle of salt and toast until beginning to brown on both sides. Toss the sweet potato onto the baking sheet and set aside. Add another tablespoon of olive oil to the skillet then add in the brussels sprouts, cut sides down to the pan. Cook for about 3-4 minutes or until the cut sides are starting to brown. Stir and cook another 2-3 minutes. Then add the brussels to the sweet potatoes and continue to cook them both by roasting them in the oven for 25 minutes. Meanwhile, add the last tablespoon of oil to the skillet along with 1/4 teaspoon of salt and 1/2 teaspoon of thyme and all of the mushrooms. Saute for 3-4 minutes then remove the mushrooms to another plate. Lastly, add the quinoa and stock to the skillet, bringing them to a simmer. Cook for about 15-20 minutes or until stock is absorbed and quinoa is soft. By this time the veggies will be done and you can add them to the top of the skillet along with the mushrooms. 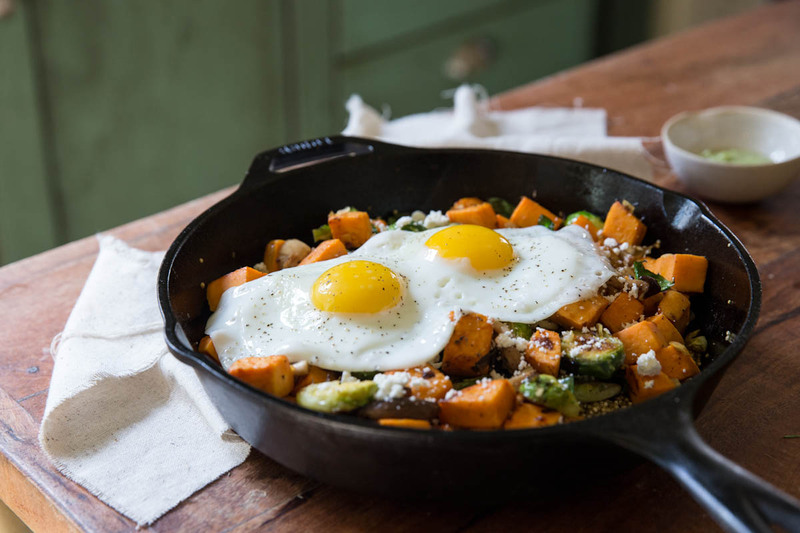 Top the skillet with a few fried eggs and feta cheese. 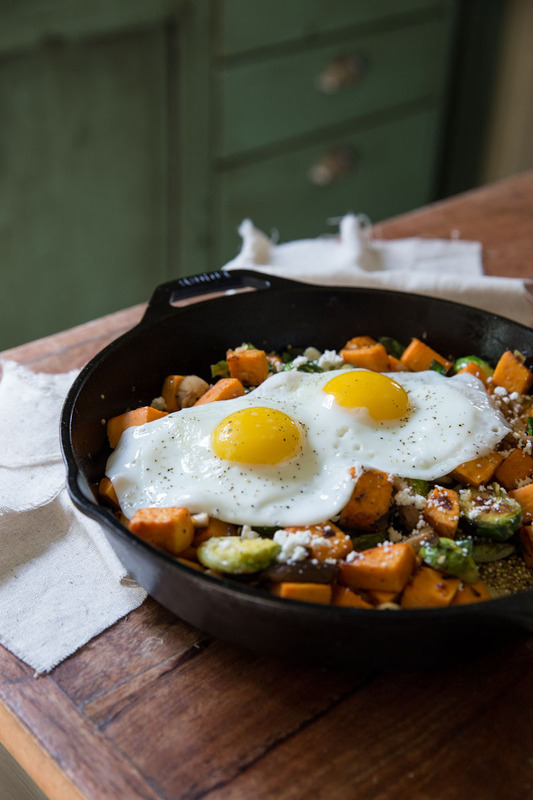 The hash can be made in advance and reheated in a skillet then topped with a fresh fried egg. For another hash recipe check out Well Plated for Erin’s Curried Chickpea and Broccoli Hash. This one’s on my short list!! 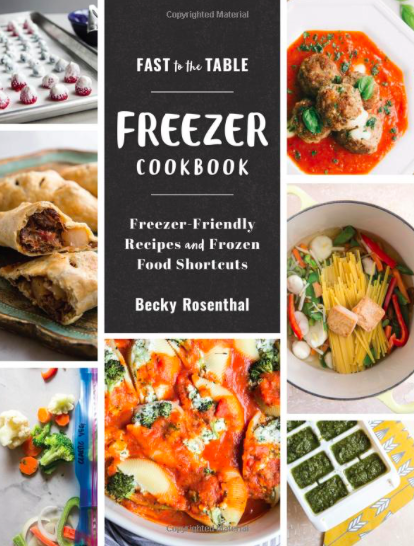 I love this, Becky! 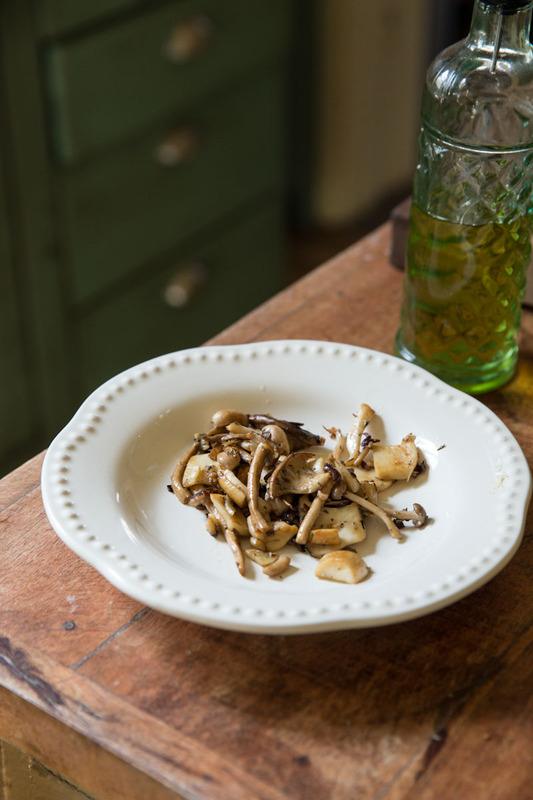 I’m all over the mushrooms right now and a hash is such a great, healthy way to start the day! It’s like I’m discovering mushrooms for the first time. I don’t know why I don’t use them more. So much flavor in such a small ingredient! Thank you for recreating that recipe! Can’t wait to give this hash a try at home this weekend. You can do it Anna!! I promise it’s not too hard. Please let me know if you have trouble with anything. Yes, Thank you so much, Becky! You are so kind 🙂 I’ll try my best to make my husband feel happy! Made this meal this evening for my husband, my sister and I. We thought it was unusual and absolutely loved it! Especially with the lime-avocado-honey dressing. Thank you – from the Netherlands. Loudy, that just makes my day!! I’m so glad you enjoyed it and that you shared it with family!! Thanks for your nice message all the way from the Netherlands!! Sure, it think it would definitely be good without mushrooms as well! wow , its tasted very good . thank alot , i made it and it was very nice . Great food, it looks unbelivebely well! I love this dish, it looks delicious and is full of regular staples we usually have in stock in our kitchen. I was hoping it might be a nice simple go-to dish. 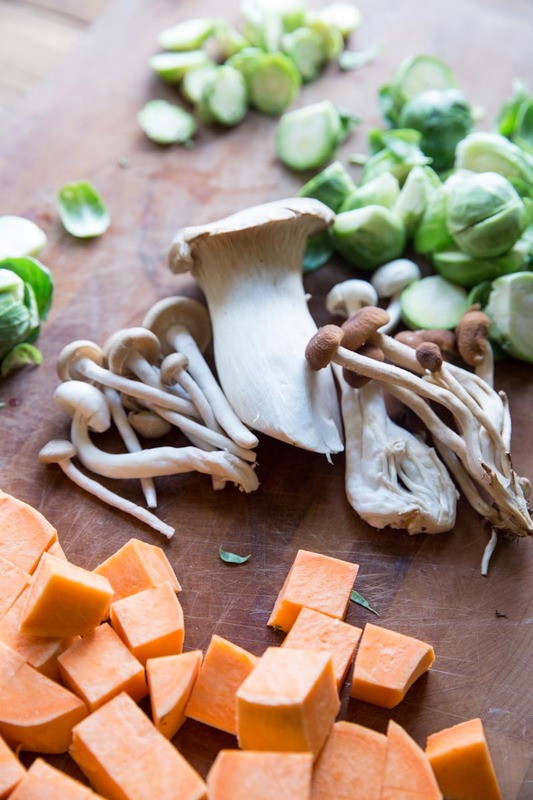 The recipe card says 19 minutes for time, but by the time you chop veggies, Brown potatoes, Brown Broadwell sprouts in pan, roast then for 25 min, saute the mushrooms, cook the quinoa, (fry the egg), and compile it all back together…. It seems more like well over an hour. Do you have a secret to making this a bit more simple for a quicker weekday meal? how do you get it to 19 minutes? Ali, so sorry for that misprint! They way I wrote the recipe, you’re right, it would take at least 45 minutes! 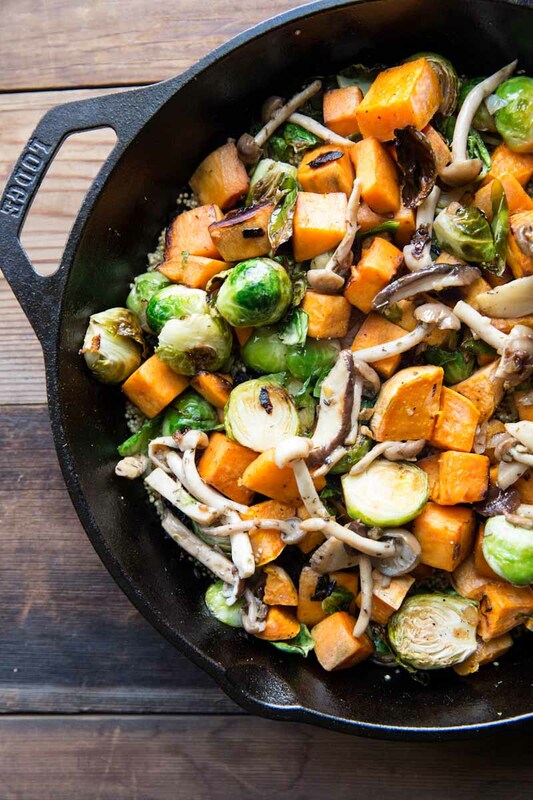 To simplify, you could just throw the brussels and potatoes in the oven and roast for 35 minutes and while they’re roasting, make the quinoa and saute the mushrooms. This should shave off at least 10 minutes or so! Thanks for messaging me and I’ll make changes to the timing on the recipe card. Love your recipe. Going to try this idea. Thanks.